Dr. Miloshoff and Dr. Feipel were both interviewed by local news stations about the 2017 Solar Eclipse! Two of our doctors were interviewed by a couple local news stations on how to view the 2017 Solar Eclipse safely. You can watch Dr. Miloshoff’s interview with WTHR here. Dr. Feipel was interviewed by Fox59 and his video and article can be viewed here. Indy A-List Winner for Best Eyewear in Indianapolis in 2017! We finished #1 for the fourth year in a row in the category of ‘Best Eyewear’. Many thanks to all of our wonderful patients and staff! We greatly appreciate your support and are honored that you voted to keep us #1 again in 2017! Check out our winner’s page! 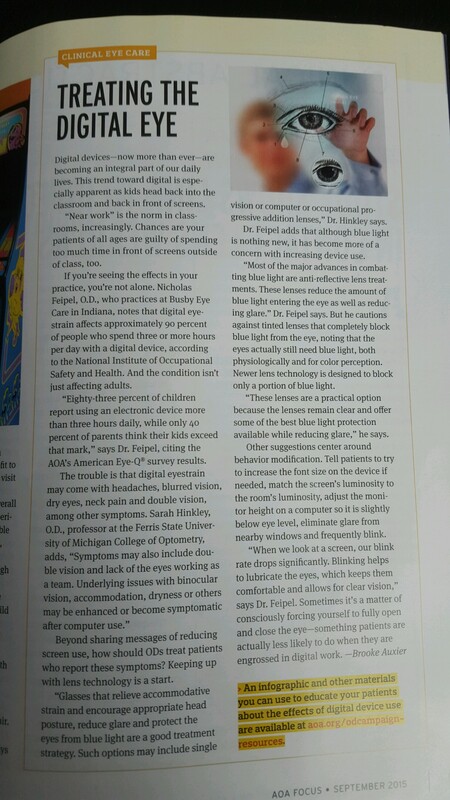 Dr. Feipel was featured in an Optometry Journal recently! 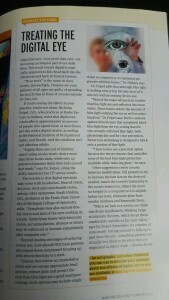 Our own Dr. Nick Feipel was recently quoted in the AOA Focus magazine that circulates to Optometrists across the country! This is the 3rd time he’s been quoted on the topic of digital eye strain! Busby Eye Care receives an A+ BBB rating! We’ve been an accredited business by the BBB since 2003! BBB has determined that Busby Eye Care, LLC meets BBB accreditation standards, which include a commitment to make a good faith effort to resolve any consumer complaints. We finished #1 for the second year in a row in the category of ‘Best Eyewear’. Many thanks to all of our wonderful patients and staff! 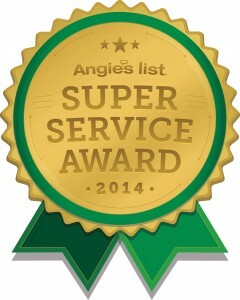 We greatly appreciate your support and are honored that you voted to keep us #1 again in 2014! 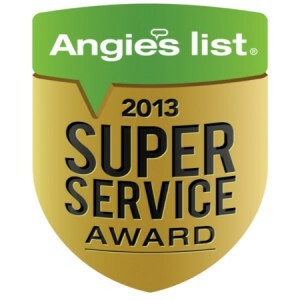 Busby Eye Care was recently featured in an educational video by Angie’s List! The 2013 World Sight Day Challenge was the most successful yet thanks to you and your efforts! Each year the campaign grows in strength and energy and we’d like to thank you for your contribution to the success of raising over $350,000 to give sight and hope to those in the most desperate need. Your practice is one of nearly 400 who participated, raising funds to achieve a bronze, gold, silver or platinum giving level. We post this award to remind your patients year-round of your charitable generosity and effort to end refractive error blindness. 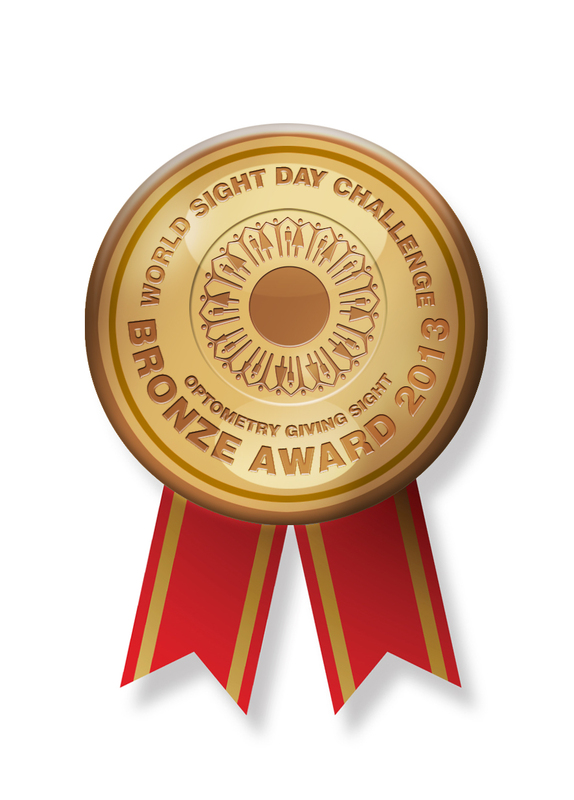 Our sincere thanks, to everyone in the practice for your generous World Sight Day Challenge donation. Your efforts transform lives through the gift of vision. On behalf of all us at Optometry Giving Sight, thank you for making a difference – and we wish you all the best in 2014. 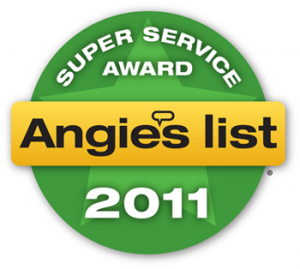 Busby Eye Care has been awarded the prestigious Angie’s List Super Service Award in 2011, 2012, 2013 and 2014, an honor bestowed annually on approximately 5 percent of all the businesses rated on the nation’s leading provider of consumer reviews on local service and health providers.